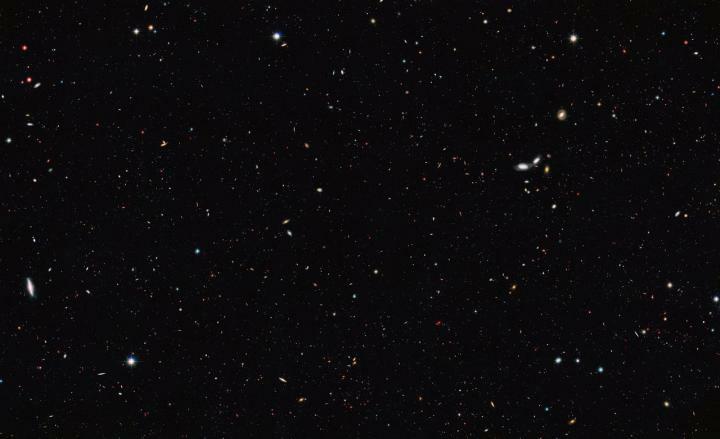 Astronomers using data from the NASA/ESA Hubble Space Telescopes and other telescopes have performed an accurate census of the number of galaxies in the Universe. The group came to the surprising conclusion that there are at least 10 times as many galaxies in the observable Universe as previously thought. The results have clear implications for our understanding of galaxy formation, and also help solve an ancient astronomical paradox — why is the sky dark at night? One of the most fundamental questions in astronomy is that of just how many galaxies the Universe contains. The Hubble Deep Field images, captured in the mid 1990s, gave the first real insight into this. Myriad faint galaxies were revealed, and it was estimated that the observable Universe contains about 100 billion galaxies . Now, an international team, led by Christopher Conselice from the University of Nottingham, UK, have shown that this figure is at least ten times too low. Conselice and his team reached this conclusion using deep space images from Hubble, data from his team's previous work, and other published data . They painstakingly converted the images into 3D, in order to make accurate measurements of the number of galaxies at different times in the Universe's history. In addition, they used new mathematical models which allowed them to infer the existence of galaxies which the current generation of telescopes cannot observe. This led to the surprising realisation that in order for the numbers to add up, some 90% of the galaxies in the observable Universe are actually too faint and too far away to be seen — yet. "It boggles the mind that over 90% of the galaxies in the Universe have yet to be studied. Who knows what interesting properties we will find when we observe these galaxies with the next generation of telescopes," explains Christopher Conselice about the far-reaching implications of the new results. In analysing the data the team looked more than 13 billion years into the past. This showed them that galaxies are not evenly distributed throughout the Universe's history. In fact, it appears that there were a factor of 10 more galaxies per unit volume when the Universe was only a few billion years old compared with today. Most of these galaxies were relatively small and faint, with masses similar to those of the satellite galaxies surrounding the Milky Way. These results are powerful evidence that a significant evolution has taken place throughout the Universe's history, an evolution during which galaxies merged together, dramatically reducing their total number. "This gives us a verification of the so-called top-down formation of structure in the Universe," explains Conselice. The decreasing number of galaxies as time progresses also contributes to the solution of Olbers' paradox — why the sky is dark at night . The team came to the conclusion that there is such an abundance of galaxies that, in principle, every point in the sky contains part of a galaxy. However, most of these galaxies are invisible to the human eye and even to modern telescopes, owing to a combination of factors: redshifting of light, the Universe's dynamic nature and the absorption of light by intergalactic dust and gas, all combine to ensure that the night sky remains mostly dark. The limited speed of light and the age of the Universe mean that the entire Universe cannot be seen from Earth. The part visible within our cosmological horizon is called the observable Universe. The study uses data from Perez-Gonzalez et al. (2008), Kajisawa et al. (2009), Fontanta et al. (2004, 2006), Caputi et al. (2011), Pozzetti et al. (2009), Mortlock et al. (2011), Muzzin et al. (2013), Mortlock et al. (2015), Duncan et al. (2014), Grazian et al. (2015), Tomczak et al. (2014) and Song et al. (2015). The astronomer Heinrich Olbers argued that the night sky should be permanently flooded by light, because in an unchanging Universe filled with an infinite number of stars, every single part of the sky should be occupied by a bright object. However, our modern understanding of the Universe is that it is both finite and dynamic — not infinite and static.